This was purchased about two years ago, at a big box store as an unnamed succulent. It has since produced the smaller offshoot. The leaves turn yellow and snap off at the stem if I over water. 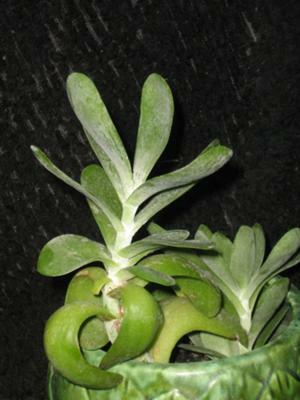 The leaves grow in opposing pairs, with about 3/8" between pairs of leaves. The mature leaves are almost as long as my index finger. 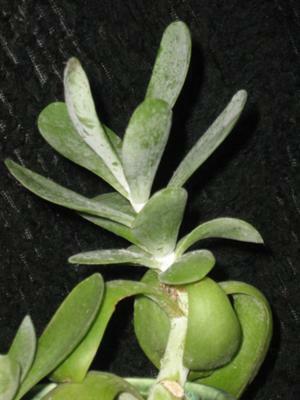 The leaves have a narrower base and form a smooth widening curve to the tip. The leaves are slightly dished upwards, and have a crisp knife edge. They are fleshy but thin, not as turgid as jade leaves. The stem is fleshy, not woody. The pictured plant is in a 6" pot. This appears to be some type of Kalanchoe, based on the description of the white bloom (powdery substance all over the stem and leaves, not a flower) and the fact that it grows in tiers of opposing leaves. I've done a search but can't find any Kalanchoe that are similar to yours, but that's certainly a place to start. 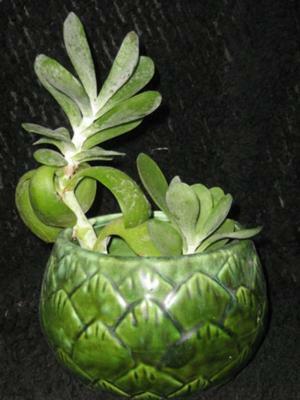 For care, look on this page: Kalanchoe thyrsiflora. Make sure you follow the links and the comments.